The 28th annual Esso Golden Ring tournament brought more than 2,000 ringette players and 175 teams to Calgary, with participants playing a staggering 338 games. 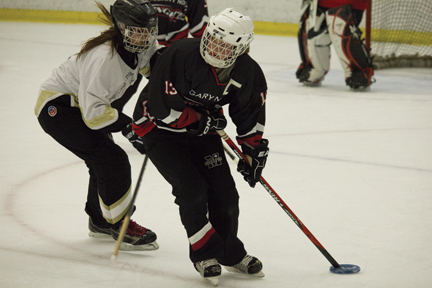 The tournament is hosted every year on home ice and the number of participating teams continues to increase as the Canadian-made sport grows in popularity particularly amongst women. Bob Stockton, head Coach of Calgary’s U19 North Nova, maintains that the sport is unique and is nothing like its sister sport, hockey. The game was invented in Canada in 1963 in North Bay, Ontario, by Sam Jacks. Since then, the game has become popular both within Canadian borders as well as in other countries such as the United States and Finland. Jacky McCutcheon, player on team Nova and a Mount Royal student, said she got into ringette after watching her friend play eight years ago. McCutcheon maintains that the sport doesn’t get a lot of press, and that the Golden Ring is a great way to spread the word about ringette. Defensive player for Nova, Jill Horne, got into the sport at a young age after first trying out hockey. Horne agreed with McCutcheon that using the tournament is a good way to spread the word about ringette. “It gives a huge awareness to the rest of Canada, and the overall ringette community, on how much fun it is,” Horne said. McCutcheon added that the tournament allows them to play teams with a different skill sets that will help them improve as players in the long run. Horne added that she looks forward to the active, competitive atmosphere that the tournament brings to Calgary. “There’s so many amazing teams that come and play here, see them and watch them play makes you learn new things and makes you want to be better,” Horne said. Calgary North Nova placed second overall in their U19 B division after playing the Rockyford Ringers on Jan. 19.